« Day 226 in Beijing: BEAT IT! 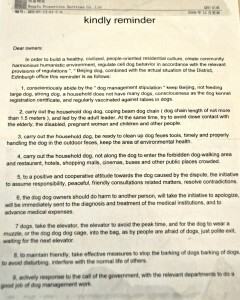 Day 227 in Beijing: Letters From The Edinburgh Mansion Park. The Dog Dog really needs some help (Click on the picture for an enlargement). I am a big fan of Chinglish. If you don’t know what Chinglish is, I’ll define it. Here is the basics of it: Chinglish is the translation of words from Chinese to English. Both Chinese and English are very difficult languages and Google Translate has helped in a lot of ways for people speaking one or the other language to understand each other. Google translate has also hurt people trying to understand each other because some of the translations are rather, how shall we say, colorful? 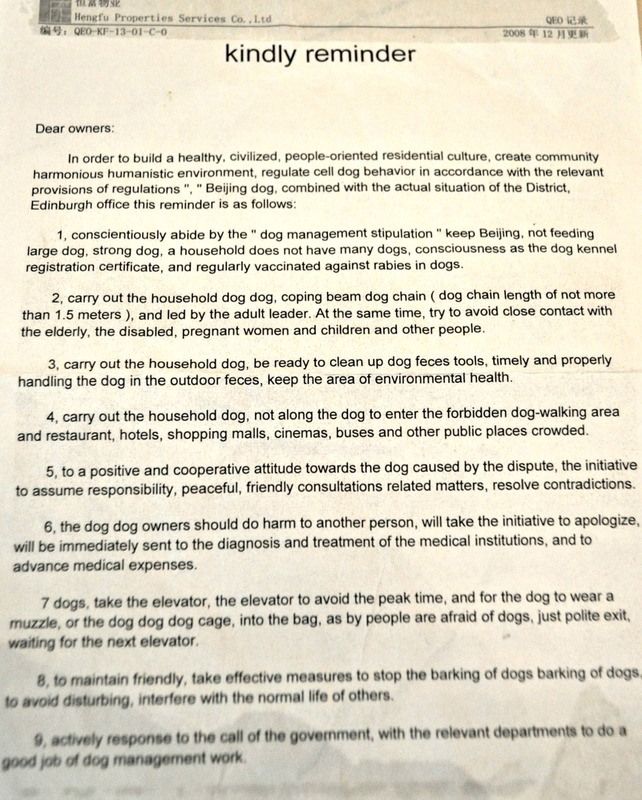 I have two friends that live in a apartment complex and they’ve been paying attention to the Chinglish letters that have been posted by management to help people have a more peaceness and healthyful happinesstime for your day to be great kind of day.